Kaplan's ACT English, Reading & Writing Prep provides focused practice and expert tips to help you sharpen your skills so you can face the test with confidence. Kaplan is the Official Partner for Live Online Prep for the ACT. For more information visit kaptest.com/onlinepreplive. 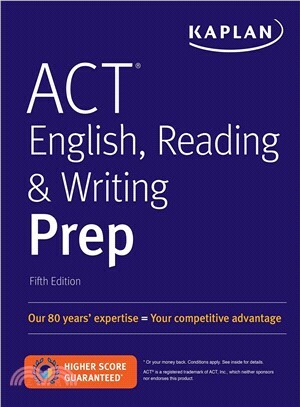 Kaplan is so certain that ACT English, Reading & Writing Prep offers the guidance you need that we guarantee it: After studying with our book, you'll score higher on the ACT—or you'll get your money back. We know the test: Our Learning Engineers have put tens of thousands of hours into studying the ACT – using real data to design the most effective strategies and study plans. Kaplan's expert psychometricians make sure our practice questions and study materials are up-to-date and true to the test.